I think I should preface this post by explaining my stance towards that most clichéd of Chinese culinary clichés, lemon chicken. It's that type of dish available at every "Chinese" restaurant, right from the Flower Drum, down to your little suburban takeaway, in varying quality (usually poor). Generally it consists of pieces of battered, deep-fried chicken, doused in a luminescent yellow "lemon-flavoured" sauce. I don't think it bears any resemblance to anything people in China actually eat, and for the longest time, I refused to order it, even in better restaurants, believing that my selecting lemon chicken would diminish my food credibility. This was, of course, until a couple of weeks ago, when I saw Bill Granger make it on his program, bills food 2. 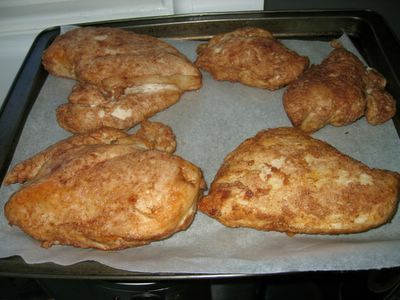 He dusted chicken breasts in flour and five spice powder, fried them until they were crispy, and put them in the oven until they were cooked. He then doused the cooked chicken pieces in a sauce made by stir frying wedges of real lemon with ginger, rice wine, honey, brown sugar, soy sauce, lemon juice, chicken stock and cornflour. It looked good. Really good. So good that my dad insisted that I make it as soon as possible, and so good that I instantly threw away my prejudice against declassé foodstuffs and decided that, good God, yes, I too must have this lemon chicken. The recipe appears in Every Day, and Bill serves it with oven-baked rice, made special with the addition of Chinese cabbage, peas, rice wine and ginger. Now, although I was more than ready to embrace lemon chicken, I still couldn't countenance oven-baked rice (I mean, why?). I just cooked it on the stovetop, but a rice-cooker would work equally well. While the rice was cooking, I got on with the chicken. How beautiful does floured and fried chicken look? Frying this chicken, I was suddenly inspired to make some good ol' Southern fried chicken. Nigella has a fab looking recipe, as does Tyler Florence. Soon, soon. As you can see from the first photo, I piled all the rice, chicken and sauce onto one large platter to share with my family. It was the only appropriately Asian-looking dish I had. In the book, Bill says that the recipe reminds him of Chinese dining in suburban Melbourne. So true! I'm from suburban Melbourne! And it's such a staple dish - I used to eat it all the time as a child, before I worried about what was "cool", and before I though of fluroscent food as a problem. But having said that, Bill's version is a far cry from the dodgy takeaways of my childhood. It tasted absolutely wonderful! It was fresh and light, whilst at the same time being substantial enough for a proper dinner. The rice, additionally, was a great accompaniment. Yes, lemon chicken is a culinary cliché. But when it is made like this, fresh and delicious, it hardly matters. OK Sarah, you've twisted my arm - I'll go and look the recipe up now! Well done, it looks truly delicious! 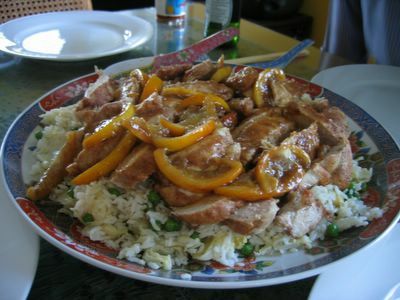 Tom N-D has a great recipe for 'lemon chicken' too. The lemon flavor really comes out, and that is not easy to say about the standard chicken breast. I think Bill is becoming your BFF!. Funny! I watched that episode too. And thought ugh lemon chicken. Ugh blinding bill smile. But it really did look good and inspired me to want to make it. ja. lemon chicken and S&S pork are the "white trash specials" in every chinese restaurant. Any chance of listing the ingredients buttercup? Mmmm, no ingredients given for lemon chicken :( If you list them I reckon and I can reverse engineer the dish so that I don't trouble you for the full recipe buttercup. Here are the ingredients. Sorry about the delay! I am making this tomorrow night, (i watched Bill make it a couple of weeks ago and just googled it and came across your blog, so glad you enjoyed it. Also, i make a version of fried chicken from a Rachel Ray recipe, she uses butter milk i but i just skim. The flour is: plain flour, paprika, mustard (powder), garlic powder and salt and pepper. Just dip the chicken into the milk, then into the flour coat evenly, back into the milk and back into the flour. Deep fry turning until is a dark golden brown and there you have delicious fried chicken. If Bill Granger devises a recipe, it will work wonderfully. 'Nuff said.